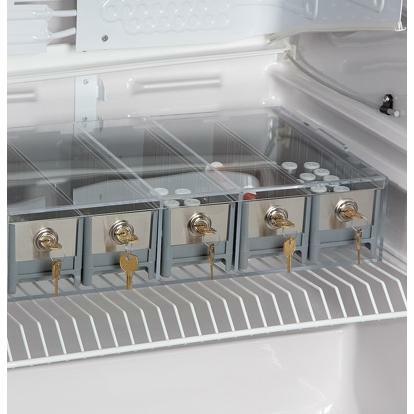 Stackable, individually locking refrigerator cassettes keep temperature-sensitive meds organized and secure. Three-drawer and Five-drawer drug boxes are for storing refrigerated pharmaceuticals. Available with Clear or White frames. Specify color when ordering. Three-drawer locking drug storage box is also available (#18538). Each drawer has a cam lock and is keyed differently. Clear cassettes make it easy to view contents even when the cassette is locked.